Truck must be parked in a parallel manner within two (2) parallel or three (3) diagonal parking spaces. Trucks parking in diagonal spaces cannot exceed 22 feet. Serving window must face sidewalk and cannot face traffic. Trucks may not sell directly in front of any main entrance to an adjacent business. Trucks must be at least twenty feet (20') away from any crosswalk at an intersection. Special permission is required to park in municipal parking lots. Special permission is required to park on City park property. No parking in any areas along the parade route or obstruct parade viewers. All parking ordinances, including ordinances limiting the duration of parking, shall apply to food trucks except as specifically provided in Sec. 26-429. No parking within 15 feet of a fire hydrant. No parking between the hours of 2:00 a.m. and 5:30 a.m.
No parking for more than two consecutive hours between the hours of 8:00 am and 5:30 pm on Mondays through Saturdays. Food truck operators must be actively engaged in food vending operations at all times while parked on the public right-of-way. The City Food Vendor License must be displayed at all times in a conspicuous place where it can be read by the general public. Operators must provide one private trash bin and one private recycling bin for public use with capacity of no less than 30 gallons each, and shall remove all refuse within 25 feet of the food truck. Refuse shall be removed at the food truck operator’s expense and shall not be placed in an unauthorized private or City receptacles. 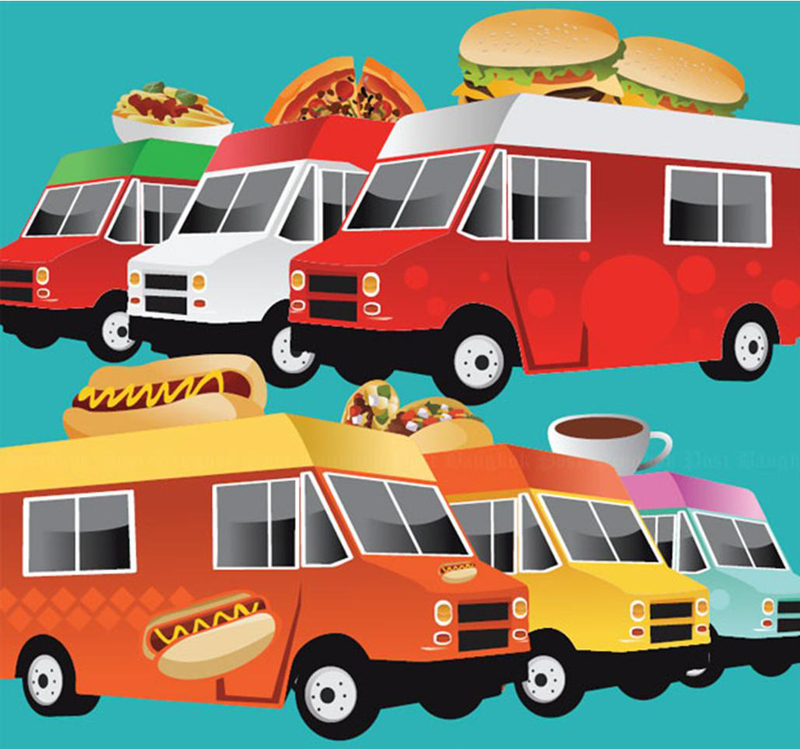 Food trucks shall provide equal access to goods and services to people with disabilities by providing an accessible counter height or by modification in policies, practices, and procedures; provision of auxiliary aids; and removal of barriers. No tables or chairs shall be used in conjunction with the operation of a food truck. All signs shall be located upon the food truck. No electronic signage is permitted. Food trucks are subject to the city noise ordinance. Operators may not place any object that blocks pedestrian traffic. Compliance with the minimum public health and safety requirements as made and enforced by the South Dakota Department of Health, pursuant to SDCL Chapter 34-18. Provide proof of an annual third-party inspection of propane fill or gas-related capabilities. Sign a statement holding harmless the City and shall indemnify the City, its officers and employees, for any claims for damages to property or injury to persons which may occur in connection with any activity carried on pursuant to any activities associated with food truck vending. Furnish and maintain a policy of insurance protecting the Applicant and the City from all claims for damage to property or bodily injury, including death, which may arise from activities associated with mobile food vending. The insurance policy shall list or endorse the City as additional insured and carry minimum liability limits of at least $1,000,000 per occurrence. The endorsement shall provide that the policy shall not be terminated or cancelled prior to the termination of the food truck permit without 30 days written notice to the City. Any permit for food truck vending shall be deemed void in the absence of a current insurance policy meeting the criteria. Any permit issued under the provisions of this ordinance may be revoked for violation of any provision of this Code, State law or City ordinance by the City Clerk or designee. Upon the revocation, the permit shall immediately be surrendered, and failure to do shall be a violation of this ordinance. In addition, the Police Department is authorized to suspend a permit at any time in the event of prohibited conduct by a food truck operator. The food truck operator shall be provided an opportunity to remove the suspension following a meeting with the City Clerk and Police Chief during regular business hours following the suspension. Violation shall subject the violator to revocation of the permit and a fine of up to $200.00. Each day a violation occurs may constitute a separate offense.